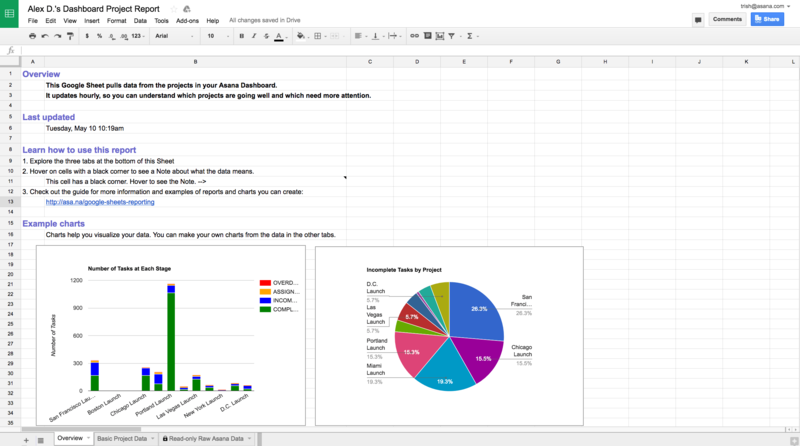 Google Sheets is a web-based spreadsheet application and part of Google Drive. It’s used for any function you’d normally use an excel spreadsheet for: tracking data, calculating expenses, creating reports, and more. Google Sheets is especially powerful when linked with other commonly used applications and tools such as Asana, so you can get automated analytics on your application data. Why use the Google Sheets and Asana integration? Portfolio reporting in Google Sheets pulls data from Asana projects in your Portfolio so you can create custom reports and visualizations. Portfolios in Asana help you monitor the progress of key initiatives. The Asana and Google Sheets integration lets you use your Asana portfolio data to build custom reports — tables, charts, scatterplots, and more — in Google Sheets. Get insights on the rate at which initiatives are progressing, who on your team is completing work the fastest, and more. In Asana, navigate to Portfolios. Click Open Report in Google Sheets. (You’ll see this prompt in small type in the upper left). Allow Asana to view and manage your spreadsheets in Google Drive. Data from your portfolio will then open in an organized Google Sheet in a new browser tab.